$310,000 in Total Grants to 24 Garden Projects! 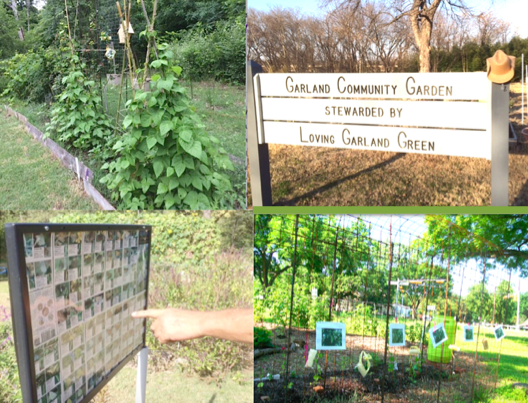 Scenes from the Garland Community Garden: top left our pole beans from 2016; top right a sign made for us by our Garland Parks and Recreation Department; bottom left a sign showing all the butterflies of North Texas; bottom right our loofah tunnel in the early spring before the vines started crawling--we huge signs with pictures of the loofahs for a tour of 110 school children. Loving Garland Green needs your help! We have submitted a grant application in the 2017 Seeds® of Change Grant Program, and need you to vote for us on their website and help us win a $25,000 grant. Seeds of Change®, a leading producer of sustainably grown organic seeds and nutritious organic foods, is a true seed-to-plate brand committed to helping people create healthier and greener communities. They deliver an annual Grant Program that benefits school and community gardening and farming programs in the United States, because they understand the value of food, farming, sustainability and nutrition education. Through the donation of a percent of net sales, this year, Seeds of Change® is awarding $310,000 in total grants to 24 garden projects around the country. Please visit the Seeds of Change® Grant Program website at seedsofchangegrant.com to help increase our chances of receiving grant funds to support our gardening initiatives. You can vote once per day from March 30 to April 19. Once voting closes, the 50 organizations with the most votes will move on to the final judging phase and 24 recipients will be announced around May 8. For more information about Seeds of Change® or the Seeds of Change® Grant Program, please visit seedsofchangegrant.com. You can also share photos of your time in our garden on Facebook and Twitter using #SeedsofChangeGrant. It takes a united community to win this grant! We have passed the first hurdle by being accepted into the gallery of applicants. Whether or not we make it over the second hurdle depends on how supportive our DFW community is. The third and final hurdle will begin on April 24. A panel of judges made of of Seeds of Change farmers and brand leaders and strategic partners who will evaluate the fifty applications that received the most votes to select the 24 organizations to receive the grant awards. Applicants will be judged on food education, community impact, need based, and leadership and inspiration. 3. Select that you are not a robot and verify. Please do this once a day until April 19. Thank you. Voting once a day for the Garland Community Garden from March 30 to April 19 will benefit all those living in the DFW area. Our garden is open to the public. We share information and hold events that are open to all visitors in the DFW area. HOW WOULD WE USE THIS MONEY? 1. How would you use this grant to help your community? We would use the grant proceeds to support our mission: to increase the number of people in our community who grow at least some of the food they eat. We would use the money for demonstrations of affordable and easy gardening techniques; for free seed giveaway events; for signage with information regarding the plants and various projects ongoing in the garden; to help establish a Citizen Scientist Program whereby the Garland Community Garden would be the living laboratory; to install a gutter system on an existing building at the garden with a reservoir of 15,000 gallons. Rainwater collection from roofs is a great source of supplemental water for gardens in our drought-prone area. And finally we would use this money to help others in our city establish neighborhood community gardens. It’s a proven fact: when people live close by a community garden they more are likely to garden there. Our minority/majority city covers 57 square miles so we need lots of community gardens. 2. What does your garden do to teach people about where food comes from? The Garland Community Garden is easily accessible and is open to the public from sunup to sundown. Visitors can see plants growing from seed to food. Many gardening lessons are as informal as someone stopping in to chat with a member working in the garden. 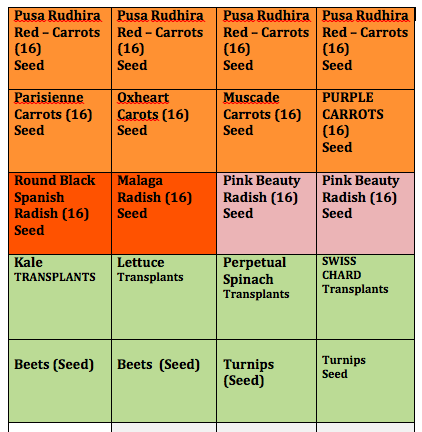 Topics at our monthly Garden Sweep range from the importance of seed selection to organic methods for dealing with pests. Some of our programs support the importance of pollinators who are responsible for one of every three bites of food that we put in our mouths. Without pollinators many of the seeds we plant would not produce food. We make presentations about growing edibles to other local nonprofits. We participate in several annual city and school sponsored health fairs. We assist people in installing urban gardens—from square foot raised beds, to container gardening, to simple pole bean planting that costs very little money to grow all the green beans from seed you can eat and also to freeze for later consumption. 3. How do you measure success for your programs? The growth of our garden is one measure of our success. We began the garden four years ago on April 24, 2014 with one 32- square foot garden plot. Today our garden has 39 plots covering over 2,230 square feet of planted space. In addition to our vegetables that we grow from heirloom seeds each year, we have eight fruit trees, four grape vines, and 22 blackberry bushes in their third year. Loving Garland Green are the official stewards of this city-owned property. One third of our produce goes to community charities. We don’t charge dues or fees for plot space. We pay our own water bill with money from quarterly yard sales and an annual pecan sale campaign. Members pick local native pecans for this sale. As we begin our fourth year we will apply metrics to measure the success of all our events and projects. The criteria will vary from project to project but will be tied to stated goals of each project. PLEASE VOTE AND PLEASE ONLY VOTE ONCE A DAY AS SEEDS OF CHANGE WILL DISCOUNT MORE THAN ONE VOTE FROM THE SAME PERSON PER DAY. This even includes votes from different email addresses, but the same person. Kickoff for Citizen Scientist Project at the Garland Community Garden! Sunday afternoon marked the official kickoff for a joint Citizen Scientist project to be undertaken by Loving Garland Green and the members of North Garland High School Environmental Club over the next seven months. On Sunday, members from the North Garland High School Environmental Club worked under the leadership of Jane Stroud, President of Loving Garland Green and Shannon Lawless, President of the Environmental Club to install plants and seeds in 44 of the 100 square feet of this plot. This bed is four feet wide and twenty-five feet long. 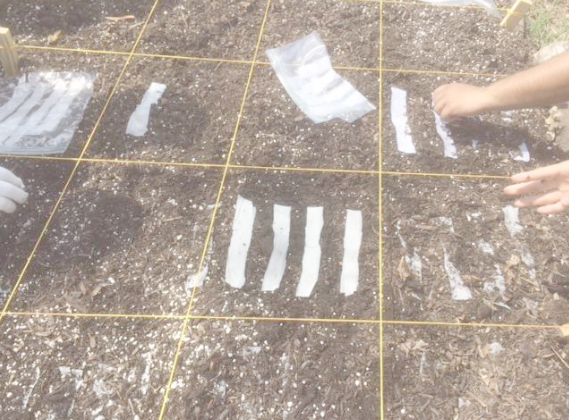 On Saturday members of Loving Garland Green amended the soil and divided 44 square feet into one-foot squares using string and wooden stakes. On Sunday the students planted 44 square feet of the garden with vegetable seeds and transplants. They the planned the plants to be installed in the remaining 54 square feet of this plot and divided the remainder of the garden plot into square feet using stakes and string as marker. Those seeds and plant will be installed this week. The goal of this project is to determine just how much food can be grown in a small urban space—and at what savings or cost to the grower. This group of Citizen Scientists will keep records of the produce—in weight and value. At the conclusion of the project during the first week in November, after sweet potatoes are harvested, the group will publish a report on the results. It’s really amazing just how much food can be grown in the tiniest of urban spaces and members of Loving Garland Green are out to show our community just how true this is. As part of our kickoff yesterday, we invited the public to come to the Garland Community Garden to view the installation of plants and seeds in our Citizen Scientist bed and while they were there, to also pick up some beanpoles and free Kentucky Wonder Green Bean seeds. In a tiny space of 3 feet by 3 feet a family of four can grow all the green beans their family can eat. Pole beans, unlike bush beans, will continue to produce beans (as long as you harvest them) from late May until the first frost. They will slow down production a bit in late July and all of August, but they will pick up again in the fall. Beans are easy and one of the most forgiving vegetables you can plant. All you need to do is amend the soil where they are to be planted with a little expanded shale or perlite. Dig a 15-inch hole for the beanpole and pack it in covering with soil firmly packed around the pole. Make four small hills around the pole and plant a bean in each hill. Water and watch grow. 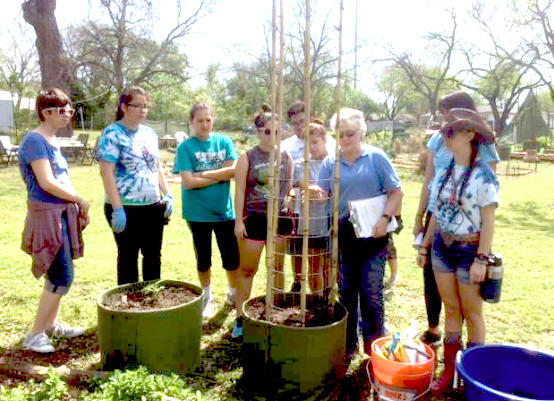 Jane Stroud, President Loving Garland Green, and students look at beanpoles in pot: You can even grow pole beans in a pot. Come down to the garden to see the trellis we have made for one of our pots. Loving Garland Green will be installing eight of these beanpole pots at the Good Samaritans of Garland in April. Being in the Garland Community Garden today as we were getting ready for the launch of our first hosted Citizen Science project tomorrow*, reminded me of all the diversity amongst us Texans. In general we are a scrappy good-hearted bunch of folks who may not always agree in opinion, but who still firmly believe that others have the right to say what they think—even if we may not like it (and may even punch their lights out over it). I realized today there are many things about our rich history that newcomers to Texas may not realize. Heck for that matter, there are a lot of things about our rich Texas history that a lot of native Texans are not even aware of. I am not one of them, however. I grew up in a small town in west Texas near Abilene—product of a German/French alliance. From my German side we had Great Cousin Johanna Engelking—a history professor at Rice University and first cousin to my grandfather. She came out every summer to spend a month with us—although I don’t know why. West Texas in July is not for the faint of heart—but then no one would count Cousin Hannah among the feint of heart so that may explain her visits. 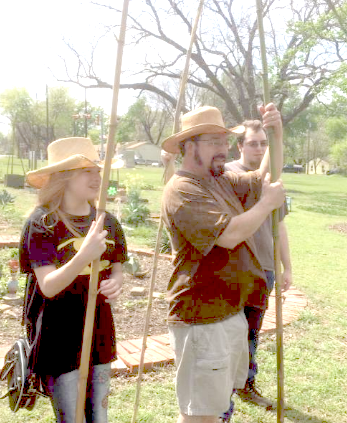 Muhammad Abdusamad and his son visited the Garland Community Garden today. 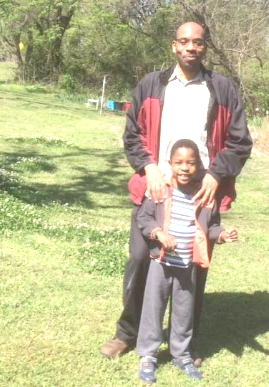 I thought about Cousin Johanna today when Jane Stroud, president of Loving Garland Green, was showing Muhammad Abdusamad and his son around the Garland Community Garden. We are looking forward to their participation in the Garland Community Garden. I smiled as Jane told him the story of how folks in Denison Texas saved the French wine industry in the late 1800’s. I wondered if Jane also had a Great Cousin Johanna. In 1880, the vineyards of France were on the verge of destruction du to the phylloxera root louse. This grapevine plague spread throughout France, and in the Charante Region (Cognac) in particular. With their economy at risk, France selected French scientist Pierre Viala to find a cure for the plague. Viala's search led him to Denison, Texas and scientist Thomas Volney Munson. Viala and Munson studied the native grapes of Texas. The soils of the Charante and Denison are very similar, and Munson knew the Texas rootstocks were resistant to phylloxera, Munson suggested that the only way to save the French vineyards was to graft the Texas rootstocks with the French vines. Viala agreed and thousands of bundles of Texas rootstocks were shipped to France to be grafted with the French vineyards. The grafting continues to this day. France awarded Munson the Chevalier du Merite Agricule, the highest award that is given to a foreign civilian. In 1888, Munson was inducted into the Legion of Honor and, to commemorate the award, a Centennial Celebration was held in Cognac and Denison 100 years later. 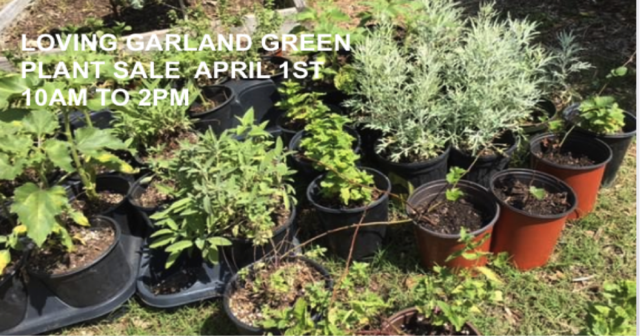 In partnership with the North Garland High School Environmental Club, Loving Garland Green is launching our first Citizen Scientist Project—a 100 Square Foot Garden. 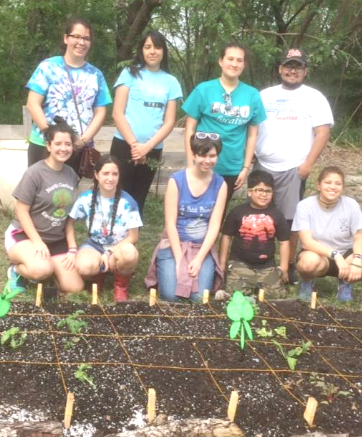 Over the next 8 months members of both organizations will be stewarding a 100 square foot garden to learn just how much food can be grown in a 100 square foot urban garden in Garland, Texas. Planting of 40 square feet of this garden will take place tomorrow, Sunday March 26 from 2 to 4 PM. We hope to see you there! Free bean seeds and poles will be given away while they last. Even Officers of the Board are not excused from the end of the month cleanup. Here on the left we have Jane Stroud, President Loving Garland Green and on the right we have Anita Opel Treasurer Loving Garland Green. 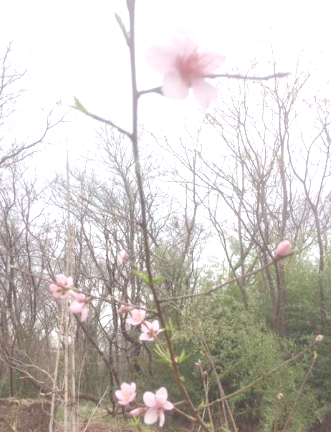 Heirloom Peach Blossoms - Garland Community Garden: It's true. You will feel better after viewing things in Nature. Philia is one of the four Greek words for love (philia, storge, agape and eros). Philia is brotherly love. Biophilia –a term coined by psychologist, Erich Fromm, means “love of life” or “love of living things.” According to Edward O. Wilson who wrote a book in 1984 titled “Biophilia”, the deep affiliations that we have with life forms and nature are rooted in our biology. Thus, human preferences toward things in nature are the product of biological evolution and survival. It is suggested, for example, that our love of flowers is deeply rooted in our subconscious because flowers are often precursors to food. A considerable body of research supports that being in nature makes people feel better emotionally and contributes to physical well being by lowering heart rate and muscle tension. Several studies suggest that spending time in nature can increase our ability to pay attention. Humans find nature interesting and can naturally focus on what they are experiencing in nature. Other research on children with ADHD shows that time spent in nature increases their attention span later. Saturday is our month-end GARDEN SWEEP. The last Saturday of the month members of Loving Garland Green, the official stewards of the Garland Community Garden, meet to sweep the garden clean, to water, to add plants and to admire. Like the garden itself, the public is always welcome. We don’t require that you work. You can come, experience Biophilia, and chat with us while we work. There will be lots to talk about as we will be preparing a project bed for planting on Sunday. 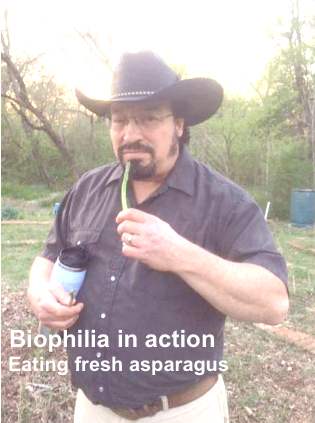 On Sunday you can experience Biophilia AND learn about how to create a successful vegetable garden here in the DFW area. [*Citizen Science projects are hosted by a wide variety of organizations. For example, today, March 22 is World Water Day as designated by the United Nations when folks all over the world support the Earth Echo Water Challenge in various ways such as by testing water. Results of these tests, taken by citizens all over the world are sent into the Earth Echo Water Challenge as part of an information-gathering process regarding the condition of our world’s water. In the coming months, Loving Garland Green will participate in more of these Citizen Science projects sponsored by other organizations. For example in September and October when the Monarchs come through our area, we will be supporting the efforts of Monarch Watch by netting and tagging Monarchs for a monitoring program hosted by Monarch Watch. Loving Garland Green is hosting this particular project on vegetable gardens to illustrate how much food can be grown in a 100 square foot urban garden plot during the growing season here in Garland. It is a joint effort being undertaken by members of Loving Garland Green and the North Garland High School Environmental Club. In addition to planting 28 square feet of the vegetable garden plot, there will be a presentation of “The Simple Art of Pole Bean Planting”. Free Green Bean seeds and poles will be available while they last. pH is a numeric expressing the acidity or alkalinity of a solution on a logarithmic scale on which 7 is neutral, lower values are more acid, and higher values more alkaline. The pH is equal to -log10 c, where c is the hydrogen ion concentration in moles per liter. If you have a swimming pool, you are familiar with the importance of maintaining a certain pH value. Avid gardeners are also familiar with the importance of knowing the pH of their soil as certain plants grow better in acidic soils and other plants grow better in alkaline soils. For example, blueberries want their soil pH levels between 4.0 and 6.0 while mint thrives at 7.0 to 8.0. When pH levels are out of balance for the plant requirements, the gardener adds needed amendments to the soil. Avid gardeners test the soil periodically throughout the growing season but it is especially recommended to test before planting in the spring and when preparing beds in fall to ensure that you are creating a healthy place for your edibles and other plants to grow. Loving Garland Green is testing soil tonight and celebrating the beginning of spring! Come join us at 6:30pm tonight. Bring a soil sample if you like. Tonight is Loving Garland Green’s third Monday of the month meeting. (You are welcome to come—6:30 to 7:30PM -216 East Kingsbridge 75040.) On the third Mondays we have member presentations and other activities. 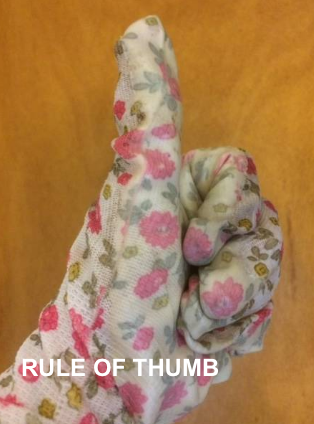 Tonight we will be testing the soil in our gardens and from the Garland Community Garden using the rule of thumb method described below and using a soil testing kit that was purchased at a big box garden store for $12. I am testing: 1) some compost from the Mesquite landfill 2) Two different commercial garden soils 3) some soil from my garden and 4) some soil from a bed at the Garland Community Garden where I plan to plant green beans. We will also be packaging some green bean seeds that we plan to give away at an upcoming Garland Community event to be held on Sunday afternoon from 2 to 4 PM—but that’s another story I’ll tell later in the week. 1. THE ALMOST FREE RULE OF THUMB SOIL TEST – only a rule of thumb for pH. 2. THE INEXPENSIVE COMMERCIAL SOIL TEST KIT- more accurate test for pH and also test for Nitrogen (N), Phosphorus (P) and Potassium (K). 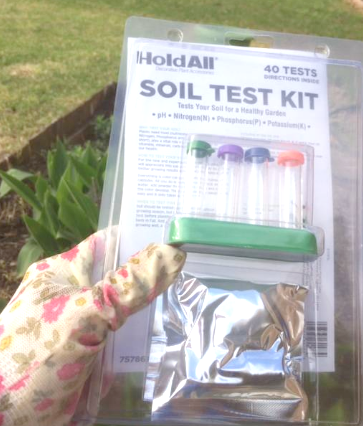 You can purchase a soil test kit from a local nursery or from a big box garden store. They cost about $12 and can test not only the pH but also the Nitrogen, Phosphorus and Potassium (NPK) levels of your soil. NPK ply a vital role in plant growth just as vitamins, minerals, carbohydrates and protein play important roles for our health. You can obtain soil testing bags and instructions from the Dallas County Extension office and send the samples off to Texas A&M for testing. Several different soil tests are available at the Extension Soil, Water, and Forage Testing Laboratory. These include tests for routine nutrients, micronutrients, boron, detailed salinity, lime requirement, texture and organic matter. After taking the soil sample, select the appropriate test to obtain the desired information. The routine test determines the soil pH, salinity, nitrates (NO3-N), and levels of the primary nutrients (P - phosphorus, K - potassium, Ca - calcium, Mg - magnesium, Na - sodium, and S - sulfur) available to plants. The routine test will provide the basic N-P-K fertilizer recommendation for selected crops. This test meets most application needs. Waiting to be Reborn as Pole Bean Pots – Oh My Aching Back! I’ve noticed that as I get older, I’m much more interested (most of the time) in keeping things simple than I was in my younger days. In other words, I’m more inclined to look for the easiest way to do something. It’s no surprise that this inclination is spreading over into my world of gardening. 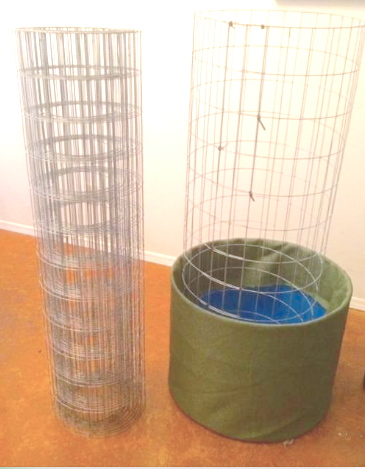 The Pole Bean Pot Components: Fencing to the left is used to fashion a trellis that will sit inside the pot along with half of a 55-gallon barrel covered with Eco-Cloth. Sometimes I forget to “keep it simple” and the old KISS formula. My inventive monkey-mind sometimes makes more work than may be necessary for me and for others (as Charlie would be the first to confirm). For example, container gardening affords urban families a great opportunity to grow edibles in a small space. To help educate folks in my community to take full advantage of this, I’m working with members of Loving Garland Green in partnership with the Good Samaritans of Garland to create a pole bean garden at the Good Samaritan house here in Garland—both as a source of fresh produce for their clients as well as to teach folks how growing some of the edibles they eat can be fun, healthy and can also even save money. I designed containers by cutting 55 gallon food-grade barrels in half, drilling holes in the bottom of each half, covering the barrels with eco fabric, and constructing a trellis out of wire fencing. 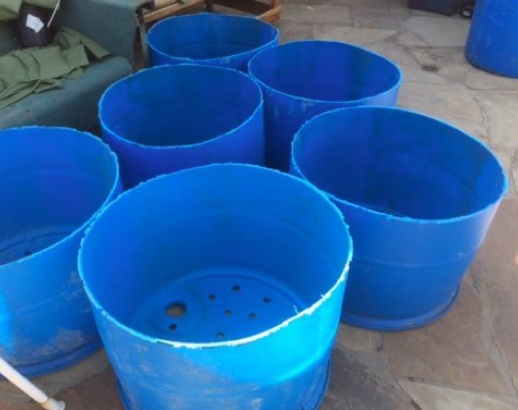 At retail the sixteen 27-gallon pots alone would cost $480 and the soil $192 would total $672. Adding the trellis, even if we made it from fencing, would bring the total to $712. Compare $712 to $60 spent and you can easily see the cost-effectiveness of this project. BUT would people currently having access to limited resources be able to duplicate it? No, of course not. Not everyone has the power tools or the skill know-how to cut the barrels in half or drill the holes in the bottom of the barrels. Not everyone has a ¾ ton truck to pick up the 55 gallon barrels or the 3 cubic yards of compost from Mesquite for $20. We don’t all have access to the same resources. Access to resources is a fact of life that many of us need to stop and consider before we criticize some folk’s lack of ability or enterprise to “pull themselves up by their bootstraps.” Generally speaking, the more wealth a person has, the more access they have to more resources. However, American ingenuity and “McGivering it” can provide us with increased leverage for achieving our goals. Note: That’s one of the things I like about Maker Spaces. They provide access to tools and shared knowledge that as an individual, a citizen might not have. Maker spaces help provide for a democratic expansion of equal opportunity by providing learning experiences through shared resources in a community. This morning it came to me, as most of my ideas, just a few moments after I awakened. Of course, this solution will only work for people who are fortunate enough to have a yard. Note: If you don’t have a shovel, borrow one from your neighbor. 2) Stick one of the poles in the center and cover back with the soil from the hole. 3) Put about 1/3 of the sack of garden soil on top. REPEAT steps 1-4 for each pole, spacing poles about 1.5 feet apart. Make sure and keep soil moist—not soaked—until beans germinate. After that, water in the mornings if the leaves look a little droopy. Pole beans are tough and they are great producers as long as you harvest them on a regular basis. In our North Texas area they will produce from June up to the first frost although production does slack off a little in late July and August. It will pick right back up again in September. Note: To recoup the investment of $23.50 for the "Tightwad's Pole Green Bean Garden", the gardener would only need to harvest 12 pounds of beans. Believe me, you are likely to get more than 25 pounds from a three-pole garden—probably enough to share with your neighbor. AND more importantly, they will taste much better than any you’ll purchase in the grocery store. The Garland Community Garden has its own special beauty—not unlike that of our City or even our nation for that matter. You won’t find all the symmetry of a European garden. Instead you will see a diversity of garden plots—each one unique, yet standing united together to create a great space for pollinators and for people. Sometimes we don’t get validation for the things we create. In fact sometimes we get resistance and criticism. Even worse, but true, some people who create beautiful things never receive validation for their work when they are alive—Vincent Van Gogh is one example of this and I could name hundreds of others down through history. Validation (approval from others that you are doing the right thing and even more importantly, that your feelings and emotions are valid) is important to all of us. Ideally, we give and receive validation to others on a daily basis. 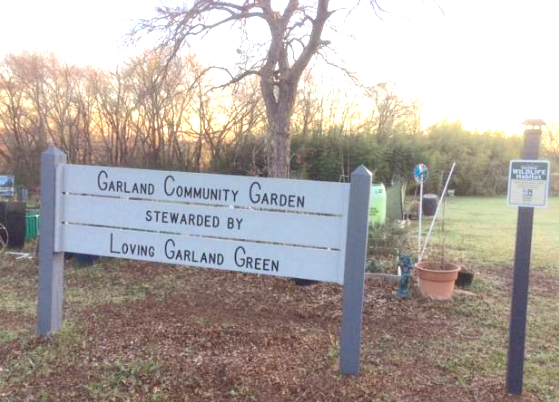 Loving Garland Green is lucky in that we have received official validation from our community for our work and particularly for our stewardship of the Garland Community Garden from several sources. In 2015 we received an award from our Mayor for our work and we won third place in a statewide award for community achievement given by Keep Texas Beautiful. Our Parks and Recreation Department had a sign made for us that folks driving by can see and know that we are “official”. The day the Garland Community Garden opened for business, the Garland City Manager had a truckload of mulch delivered to the garden. We’ve even gotten validation at a national level as well. The National Wildlife Federation has certified the Garland Community Garden as a wildlife habitat. Informal validation often arrives as a beautiful surprise. One silent form of informal validation comes when members of the community respond to our different campaigns for educating our community. Monday, for example, I was once again given validation of the success of our November Leaf Campaign. This campaign was undertaken for the month of November to raise community awareness that the leaves they put in plastic bags and place curbside go to the landfill. Over the weekend, someone had left 23 bags of wonderful mulched leaves down at the garden. On Monday, as I was emptying the 23 bags of leaves, out tumbled a perfectly intact valentine card. It was brand-new clean. I felt like it was meant for me. I picked it up, read it and then tossed it in the trash. This morning, as I was writing this post, I decided to go down to the Garden and retrieve it. As you can see from the illustration above, the message is still intact but, having survived a rain, the card is no longer clean. 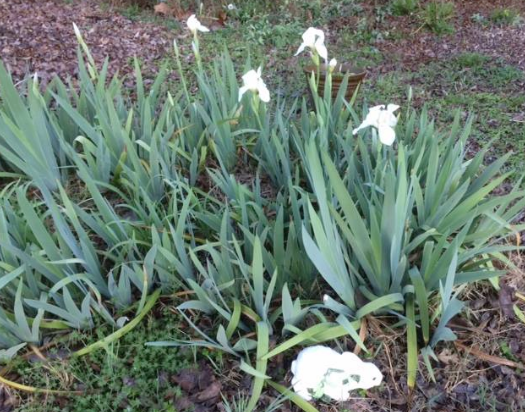 Perhaps it is a metaphor--a message from the Garden to take better care of the gifts that I receive. Just as I was leaving the Garden on Monday, a battered pickup truck pulled in. The driver, who was missing more teeth than he had, stopped and pointed to his eyes, then he pointed to the garden and patted his heart and then gave a "thumbs up". I don’t know if he could not speak at all or if perhaps he could not speak English. But it was such a sincere heartfelt appreciation that it brought tears to my eyes. I patted my heart and blew him a kiss in return. When I told the story to some Loving Garland Green members that night, the more religious among us told me that it was definitely an angel who visited the garden. Rain Gardens are a beautiful way to treat the pollution from stormwater runoff before it enters our waterways. They add aesthetic value to a site, increase wildlife habitat and are a highly effective best management practice (BMP) for treating stormwater runoff. Not only do they filter off the pollutants, rain gardens also slow the flow of the water from heavy rainfalls and thus help reduce flooding in areas prone to these incidents. The benefits from incorporating rain gardens into landscape designs are numerous. 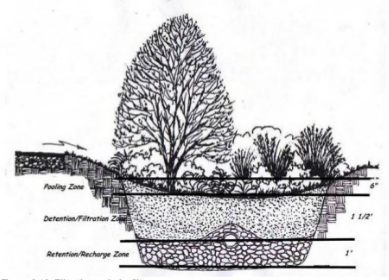 A rain garden is a shallow depression in the ground, planted with native plants that can live in a soggy environment as well as a dry environment. The depression is sculpted so storm water runs into it and gets trapped. The soil bottom of the rain garden contains different layers of materials that allow the water to drain into the surrounding soil. Once the water has been trapped in the rain garden, natural biological processes will begin to remove the nutrients from the water and break down pollutants into nutrients plants can use. It doesn’t always cost more to do things better and more ecologically friendly. The City of Bellingham, Washington found this out about 15 years ago when they designed a 550-square-foot section of land to catch runoff from a parking lot with 80 spaces. The rain garden was also designed to treat 91 percent of the runoff from a 50-year storm event. If you or your city is interested in exploring the possibility of using rain gardens as a way to help control stormwater runoff and pollution, we have a great resource right here in the DFW area: Our Dallas County Texas A&M Extension department. In particular we have two people associated with the Texas A&M system who are experts in stormwater management and rain garden design: Fouad Jaber, Assistant Professor and Extension Specialist; and Dotty Woodson, Extension Program Specialist.